A P-N Junction Diode is formed by doping one side of a piece of silicon with a P-type dopant (boran) and the other side with a N-type dopant (phosphorus).Ge can be used instead of Silicon. The P-N junction diode is a two terminal device. 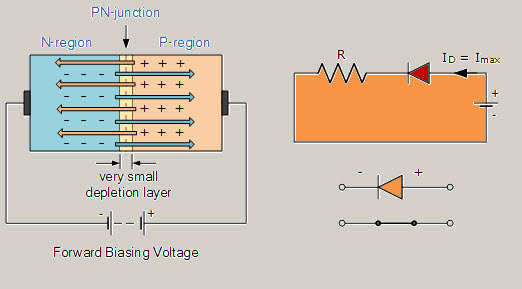 This is the basic construction of the P-N junction diode. It is one of the simplest semiconductor devices as it allows current to flow in only one direction.The diode does not behave linearly with respect to the applied voltage, and it has an exponential V-I relationship. A P-N junction diode is a piece of silicon that has two terminals. One of the terminals is doped with P-type material and the other with N-type material. The P-N junction is the basic element for semiconductor diodes. 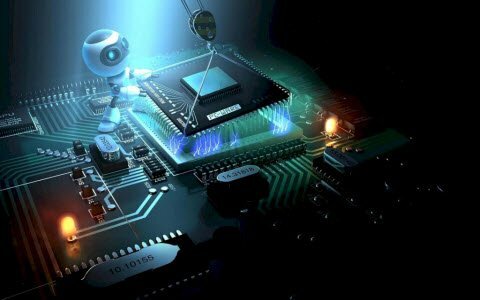 A Semiconductor diode facilitates the flow of electrons completely in one direction only – which is the main function of semiconductor diode. It can also be used as a Rectifier. 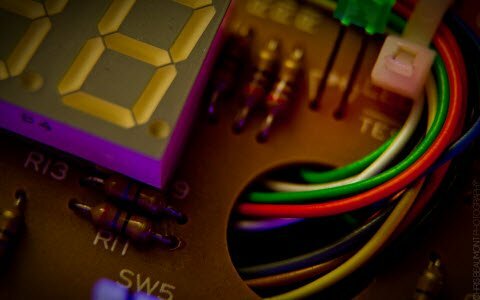 Zero Bias – No external voltage is applied to the PN junction diode. Forward Bias– The voltage potential is connected positively to the P-type terminal and negatively to the N-type terminal of the Diode. 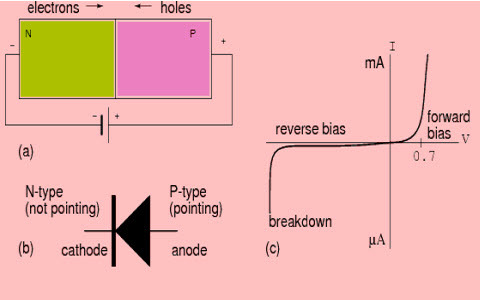 Reverse Bias– The voltage potential is connected negatively to the P-type terminal and positively to the N-type terminal of the Diode. In this case, no external voltage is applied to the P-N junction diode; and therefore, the electrons diffuse to the P-side and simultaneously holes diffuse towards the N-side through the junction, and then combine with each other. Due to this an electric field is generated by these charge carriers. Electric field opposes further diffusion of charged carriers so that there is no movement in the middle region. This region is known as depletion width or space charge. In the forward bias condition, the negative terminal of the battery is connected to the N-type material and the positive terminal of the battery is connected to the P-Type material. 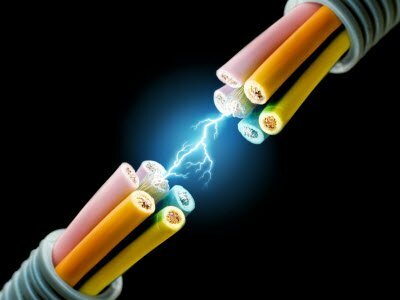 This connection is also called as giving positive voltage. Electrons from the N-region crosses the junction and enters the P-region. Due to the attractive force that is generated in the P-region the electrons are attracted and move towards the positive terminal. Simultaneously the holes are attracted towards the negative terminal of the battery.By the movement of electrons and holes current flows. In this condition, the width of the depletion region decreases due to the reduction in the number of positive and negative ions. By supplying positive voltage, the electrons get enough energy to overcome the potential barrier (depletion layer) and cross the junction and the same thing happens with the holes as well. The amount of energy required by the electrons and holes for crossing the junction is equal to the barrier potential 0.3 V for Ge and 0.7 V for Si, 1.2V for GaAs. This is also known as Voltage drop. 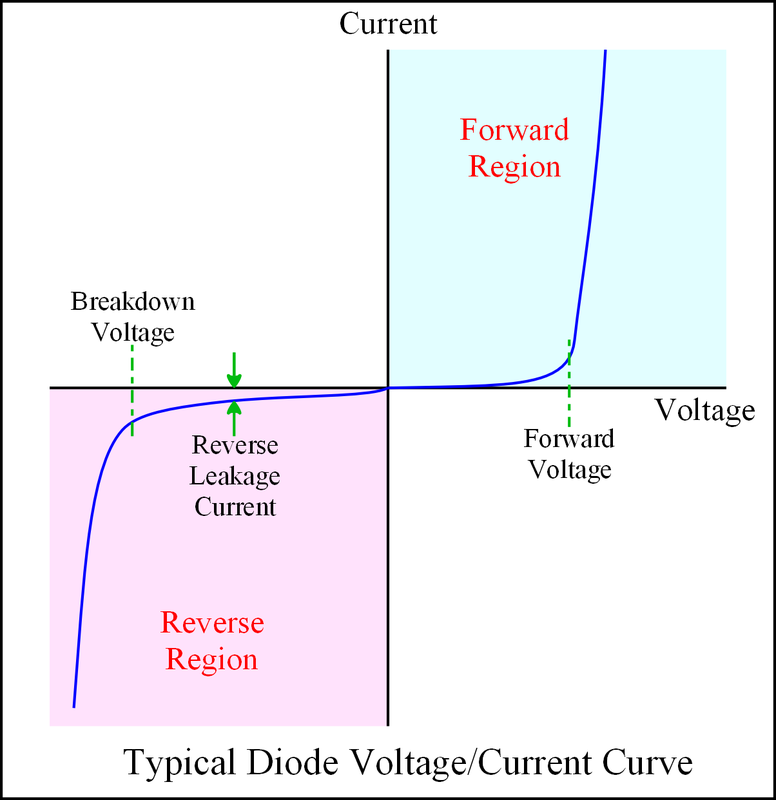 The voltage drop across the diode occurs due to internal resistance. This can be observed in the below graph. In the forward bias condition, the negative terminal of the battery is connected to the N-type material and the positive terminal of the battery is connected to the P-type material. This connection is also known as giving positive voltage. Hence, the electric field due to both the voltage and depletion layer is in the same direction. This makes the electric field more stronger than before. Due to this strong electric field, electrons and holes want more energy to cross the junction so they cannot diffuse to opposite region. Hence, there is no current flow due to lack of movement of electrons and holes. 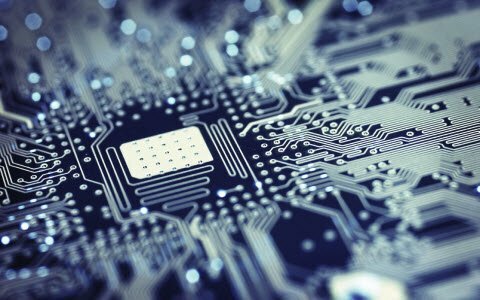 The electrons from the N-type semiconductor are attracted towards the positive terminal and the holes from the P- type semiconductor are attracted towards negative terminal. This leads to the reduction of the number of electrons in N-type and holes in P-type. In addition, positive ions are created in N-type region and negative ions are created in the P-type region. Therefore, the depletion layer width is increased due to the increasing number of positive and negative ions. Due to thermal energy in crystal minority carriers are produced. Minority carriers mean hole in N-type material and electrons in P-type material. These minority carriers are the electrons and holes pushed towards P-N junction by the negative terminal and positive terminal, respectively. 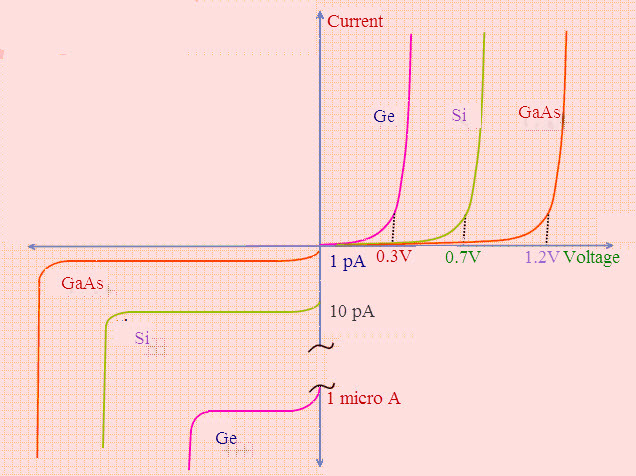 Due to the movement of minority carriers, a very little current flows, which is in nano Ampere range (for silicon). This current is called as reverse saturation current. Saturation means, after reaching its maximum value, a steady state is reached wherein the current value remains same with increasing voltage. 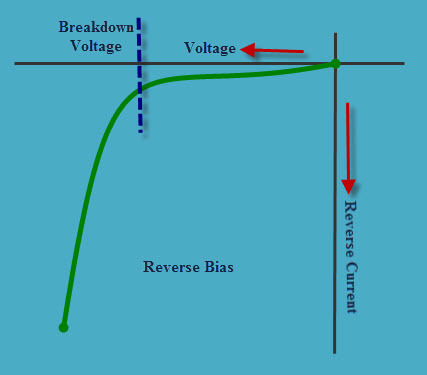 The magnitude of reverse current is of the order of nano-amperes for silicon devices. 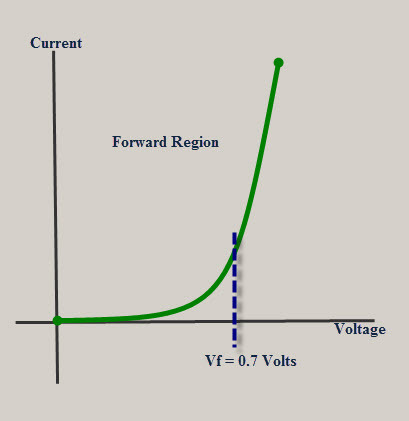 When the reverse voltage is increased beyond the limit, then the reverse current increases drastically. 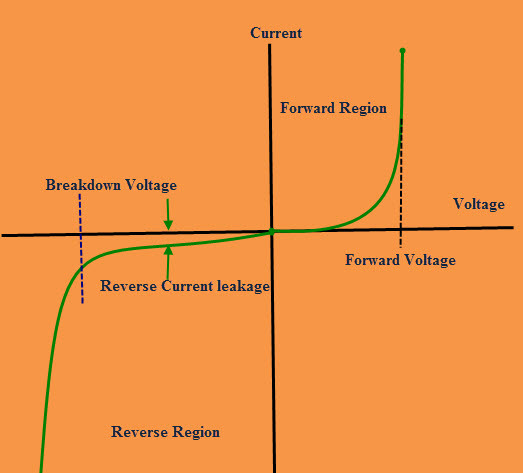 This particular voltage that causes the drastic change in reverse current is called reverse breakdown voltage. Diode breakdown occurs by two mechanisms: Avalanche breakdown and Zener breakdown. The P-N junction diode has many applications. P-N junction diode in reverse biased configuration is sensitive to light from a range between 400nm to 1000nm, which includes VISIBLE light. 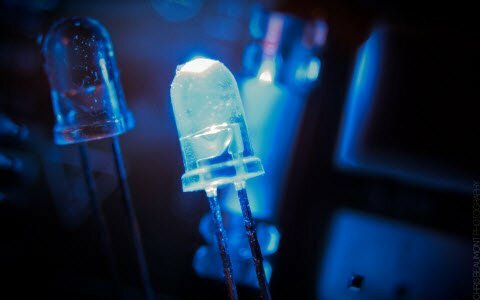 Therefore, it can be used as a photodiode. It can also be used as a solar cell. P-N junction forward bias condition is used in all LED lighting applications. The voltage across the P-N junction biased is used to create Temperature Sensors, and Reference voltages. It is used in many circuits’ rectifiers, varactors for voltage controlled oscillators. The graph will be changed for different semiconductor material used in the construction of P-N junction diode. The below diagram depicts the changes. This is all about P-N Junction diode’s theory, working principle and its applications. We believe that the information given in this article is helpful to you for a better understanding of this concept. 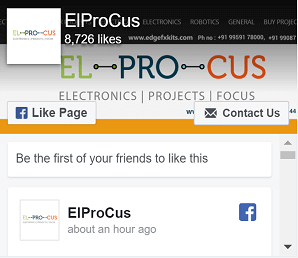 Furthermore, for any queries regarding this article or any help in implementing electrical and electronics projects, you can approach us by commenting in the comment section below. Here is a question for you – What is the main application of P-N junction diode?